An MRI on Cleveland Cavaliers point guard Kyrie Irving's left knee revealed a fractured kneecap, and he will undergo season-ending surgery in the coming days, the team announced Friday. Irving is projected to be out three to four months, the Cavaliers said. The surgery will be done at the Cleveland Clinic by head team physician Dr. Richard Parker. The 23-year-old Irving posted on Instagram after news of the surgery was announced. 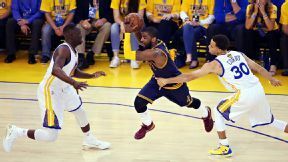 Irving collapsed as he was driving to the basket with two minutes left in the Cavs' 108-100 overtime loss to the Golden State Warriors in Game 1 of the NBA Finals on Thursday night, grabbing his troublesome left knee. Initial tests done by the Cavs' medical staff revealed no damage to the ACL or MCL, but an MRI on Friday revealed the fracture. Irving did not speak to reporters Friday before having his left knee evaluated. Cavaliers coach David Blatt said he was informed that Irving was still on crutches when the star guard left the hotel Friday morning. Irving played well in the opener, scoring 23 points with seven rebounds, six assists, four steals and two blocked shots. His block on Stephen Curry late in the fourth quarter helped the Cavs push the game to overtime. But the Warriors outscored the Cavs by 13 points with Irving off the court. Overall, the Cavaliers are 3-6 without Irving this season. Irving has been bothered by foot and then knee pain for most of his first postseason. The All-Star point guard was diagnosed with tendinitis in the second round against Chicago. A Cavaliers source maintained to ESPN.com that the fractured kneecap was not directly caused by the tendinitis, however. Irving's heavy minutes total in Game 1 could have been a factor. He suffered the injury in the 44th minute he was on the court. He had not crossed the 40-minute mark in nearly a month -- when he played 41 minutes on May 10 against Chicago -- and in a series-clinching Game 4 of the Eastern Conference finals against Atlanta, he played just 22 minutes. Cavs general manager David Griffin told TNT's Rachel Nichols at the time that Irving was on a restriction in terms of how many consecutive minutes he could stay in the game. Matthew Dellavedova stepped in during Irving's two-game absence in the East finals but played only nine scoreless minutes Thursday. • Irving created 12 assist opportunities (6-of-12 FG, 14 points) in Game 1. LeBron James (15 assist opportunities) was the only other Cavalier with more than three. • Irving drove to the basket 13 times in Game 1, creating 13 points on those plays. He and James combined for 27 of the Cavaliers' 29 drives in the game. • Irving limited Stephen Curry to 1-of-5 shooting and four points on six plays in Game 1. Curry shot 8-of-14 for 19 points on 19 plays against all other defenders in the half-court offense. Before Irving's status was released, J.R. Smith suggested that Iman Shumpert could see some minutes at point guard for Cleveland. Shumpert played the position in college at Georgia Tech. It is an unfortunate ending to an otherwise stellar season for Irving, who averaged 21.7 points, 5.2 assists and 1.5 steals per game, making his third straight All-Star Game while shooting a career-high 41.5 percent from 3 and appearing in a career-high 75 games (88 including the postseason). LeBron James said Friday that the Cavs will be prepared no matter who is available. "Well, there are a few things that you would love to have going late in the season," James said. "That's being healthy, having a great rhythm, and then you need a little luck as well. We've had a great rhythm. We haven't had much luck, and we haven't been healthy. But I haven't gotten discouraged. "I understand the moment that I'm in, and I'm not too much worried about the game. I'm worried about the moment. I'm happy with the moment. I'm excited to be in this moment once again, and I'm going to stay strong for my team, no matter who is or is not in the lineup." Game 2 is Sunday night in Oakland, California. Irving's injury immediately made an impact in Las Vegas. The Warriors were made a 7.5-point favorite for Game 2 at most Vegas sportsbooks, up 1.5 points from the Game 1 line with a healthy Irving. The Westgate SuperBook adjusted the series odds significantly, moving the Warriors from a minus-450 favorite to minus-600. The Cavaliers are now a plus-450 underdog to win the series. Information from ESPN.com's Dave McMenamin and David Purdum and The Associated Press was used in this report.